Our generously sized blanket gives you light warmth that’s great for spring, summer or any time of year. We’ve filled it with fluffy down and finished it with a shiny satin border. This light and luxe blanket comes in an assortment of modern neutrals to suit any décor. Thin and light weight yet the perfect comfort level. Superior quality and very pretty. You want to curl up with this blanket and sleep sweet dreams. Pacific Coast® 230 Thread Count down blanket will add to your peaceful sleep all year round and is ideal for warm sleepers in search of a light warmth blanket to sleep under. The oversized design ensures a generous drape that can also be tucked in like a traditional blanket. 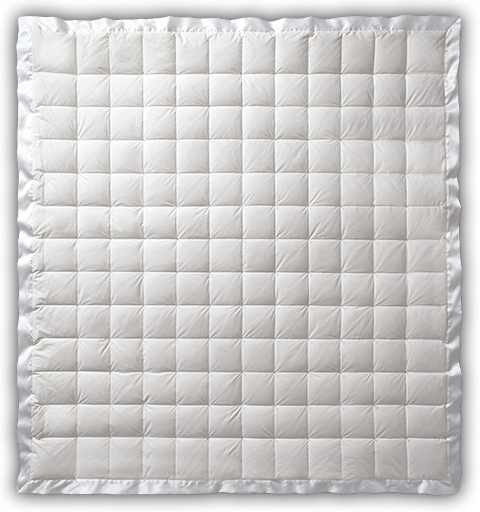 The 550 fill power down blanket is constructed using a continuous sewn through design pattern. The entire blanket is finished with a 3” satin border adding a lovely look and feel to this well made, Hyperclean™ down blanket. Machine wash and dry for easy care.